We have listed all of the affordable and low income clinics that we have found in Lawrence, Massachusetts. Our list of health care resources is by no means inclusive and is always growing. If you know of any low cost clinics in Lawrence please help contribute by Adding a New Clinic Here. This community-based health services clinic is located in Lawrence, MA . They serve the inner city population. A federal grant awarded to grantee Greater Lawrence Family Health Center Inc helps maintain operations. Operations began January of 2002. Daybreak Shelter is a community-based clinic based in Lawrence . They serve primarily the urban city population. Weekly hours of operation are 8. Federal funds granted to grantee Greater Lawrence Family Health Center Inc maintain operations. Operations began January of 2000. Good Shepherd Center is a community-based health clinic based in Lawrence, MA . They serve primarily the urban city population. This clinic is open limited hours. Opened in 2000, this is a year-round clinic. Oasis is a community clinic in Essex County . They serve the inner city population. This clinic is open eight hours a week. Federal funds granted to Greater Lawrence Family Health Center Inc help maintain operations. Opened since 2000, Oasis opens on a year-round schedule. 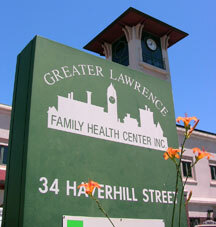 Glfhc At Lawrence General Hospital is a community health clinic based in Lawrence, MA. This clinic is open only 40 hours a week so call in advance. Federal funds granted to Greater Lawrence Family Health Center Inc help maintain operations. Opened since 2012, Glfhc At Lawrence General Hospital opens on a full-time schedule. This community-based health services center is located in Essex County. They primarily serve the urban city population. Opened in 2012, this is part-time clinic. This community clinic is located in Essex County . They serve the inner city population. This clinic is open limited hours so call for hours first. Greater Lawrence Family Health Center Inc helps maintain operations through federal funds is has recieved. Operations began January of 1987. This community-based clinic is located in Essex County . They serve the inner city population. This clinic is open limited hours. A federal grant awarded to Greater Lawrence Family Health Center Inc helps maintain operations. Opened in 2007, this is full-time clinic. This community-based health center is located in Essex County, MA. They serve primarily the urban city population. Weekly hours of operation are 8. Greater Lawrence Family Health Center Inc helps maintain operations through federal funds is has recieved. This community health clinic is located in Essex County. This clinic is open limited hours so call for hours first. A federal grant awarded to Greater Lawrence Family Health Center Inc helps maintain operations. Opened in 2006, this is part-time clinic. Mary ImmaculateRestorative Center is a community health services center based in Essex County, MA . This clinic is open limited hours so call for hours first. Federal funds granted to grantee Greater Lawrence Family Health Center Inc maintain operations. Opened in 2000, this is a year-round clinic.